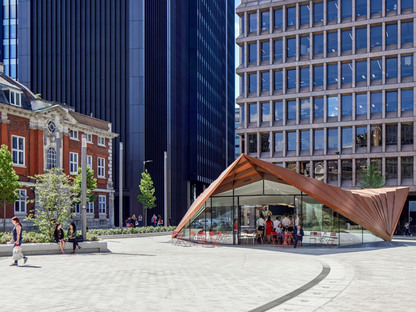 The new Aldgate Square is one of the largest public spaces in London’s Square Mile, the end result of the six-year redevelopment of an old complex roundabout from the 1960s. 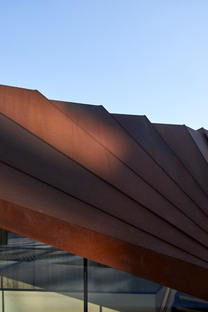 A complex, intermodal urban space marked by unsafe subways that needed to be transformed for the new infrastructures of the London public transport system in view of the arrival of the new Elizabeth line. 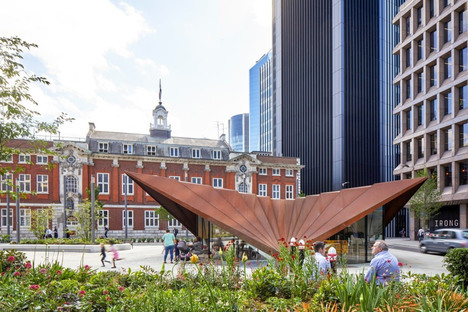 The Elizabeth line by the City of London Corporation will stretch more than 60 miles from Reading and Heathrow in the west through central tunnels across to Shenfield and Abbey Wood in the east. 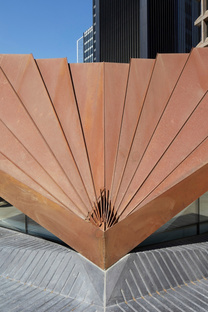 The new railway will stop at 41 accessible stations, 10 newly built and 30 newly upgraded. 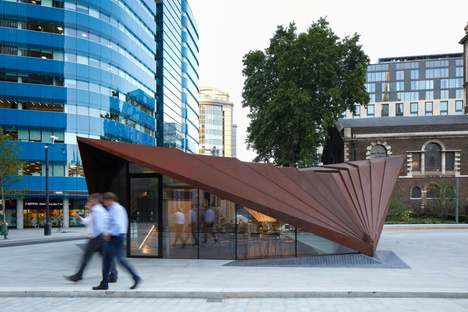 In this square, the team from Make Architects have constructed the second in a series of pavilions designed for the City of London Corporation. 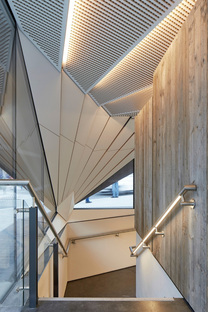 This construction was required to have an aesthetic relationship with the first, RIBA Award-winning pavilion, the City of London Information Centre adjacent to St Paul’s Cathedral, which was completed by Make in 2008. 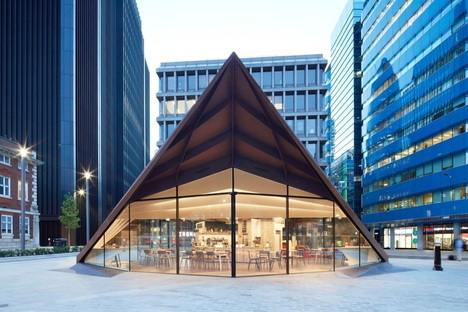 The new Portsoken Pavilion in Aldgate Square will be run by local social enterprise Kahaila as a café and multifunctional community space. 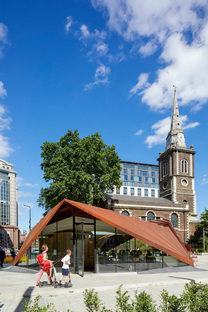 A new hub in this urban setting delivering a public amenity as well as improving the connection between the two distinctive listed heritage buildings that sit either side of the new square: the St Botolph without Aldgate church of mediaeval origin but rebuilt in the late 1700s and Sir John Cass’s Foundation Primary School. 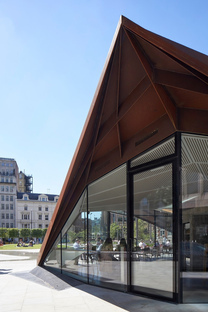 The proximity to these historical, Grade-I and Grade-II listed buildings explains the reasons for the materials selected by Make Architects: the 325 sqm building is a single storey above ground and uses Corten cladding panels for the structural skin, the colour of which sets up a connection with the historical context. 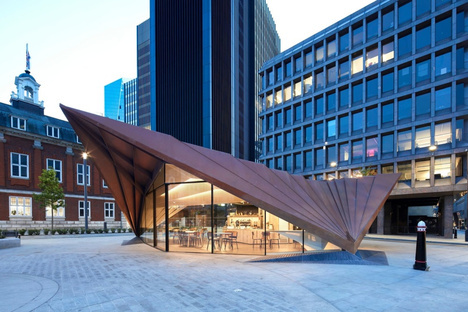 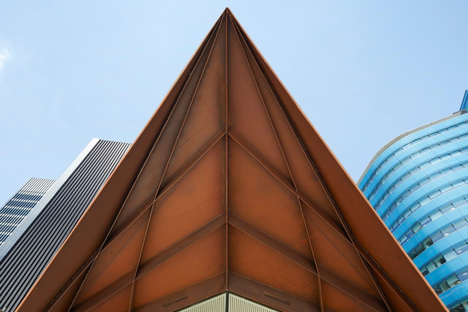 The shape picks up on the asymmetrical angles of the City of London Information Centre with an angular structure that folds down to meet the ground at just three triangular support points, with glazing in between. 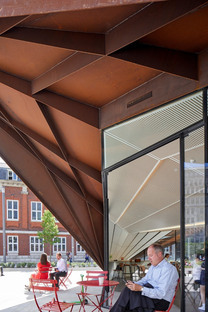 Make Architects carefully assessed the key pedestrian approaches to the new square and as such, their pavilion has no backside: its three glazed elevations face Duke’s Place to the north-west, Houndsditch and St Botolph Street to the north-east, and the new square and Aldgate High Street to the south. 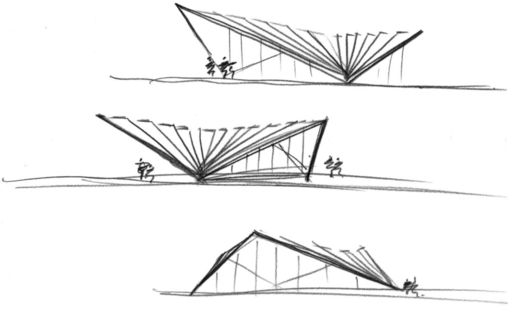 So it ends up providing clear views and entrances on all sides, a seamless transition between inside and outside, marked by the overhanging roof that protects the outdoor seating and shades the interiors. 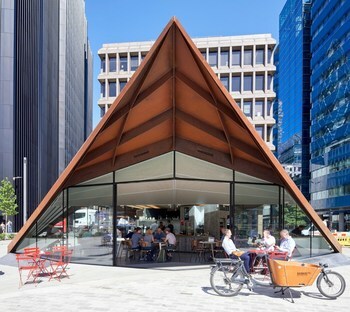 The pavilion also utilised part of the former subways to accommodate a basement level for plant, back-of-house facilities, kitchens and toilets. 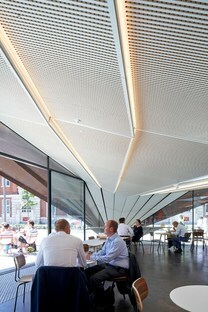 This significantly reduced the quantity of land that was needed above ground and therefore delivered more public space. 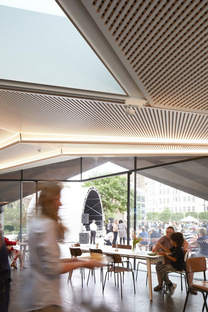 The constant temperature of the concrete tunnels also works to help regulate the temperature of the building; air is drawn through the tunnels and up into the café, heating in the winter or cooling in the summer. 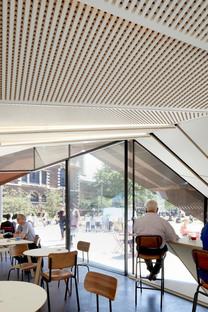 Make Architects designed the pavilion - prefabricated off-site, then reassembled and welded in situ - to be as flexible as possible and become a real hub for the community: a bright space with white interiors that could work as a café, for exhibitions, for community meetings. 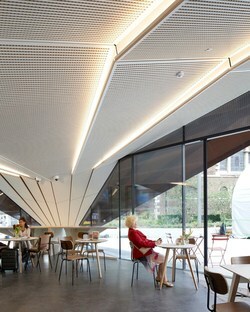 All brought together in a structure that, despite its contemporary feel, blends in harmoniously with its surroundings.